Milltek Sport recognise that the European Customer needs a very special system for the new Focus RS Mk2 2009.
are high on the list. This new Milltek Sport EC type approved 76mm down pipe is the key to unlock the power in the new Focus RS mk2 2009 edition. 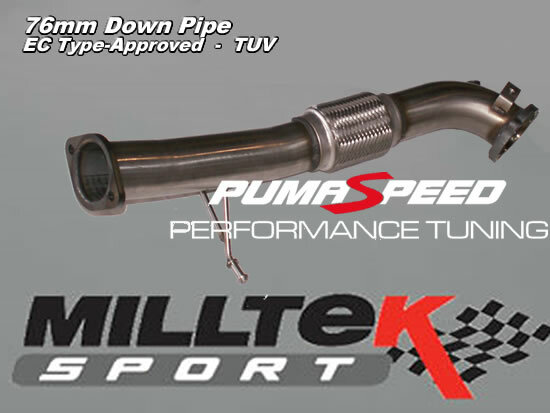 Milltek Sport Full power high flow down pipe - 76mm. Milltek Sport Full power Sport catalyst (200 cell) - 76mm tube with 120mm HJS catalytic convertor. Milltek Sport Full power Cat Back Exhaust Road Version (Resonated) - 76mm tube. With the choice of Original Polished Hand made tail pipes or the new Satin Black version tail pipes, this new system is the only TUV approved system that measures up at a Full Power 3 inch / 76mm bore size.Milltek Sport are never beaten on quality and now at EC-Approved level cannot be beaten on POWER. The Pumaspeed Workshop team are ready to fit the EC-Approved Milltek Sport Focus RS Mk2 2009 76mm Down Pipe in our Head Office located here. Therefore making parts and labour a total cost £325.54 (inc. VAT). Pumaspeed have a specialist distribution team that can dispatch the EC-Approved Milltek Sport Focus RS Mk2 2009 76mm Down Pipe to any destination worldwide.